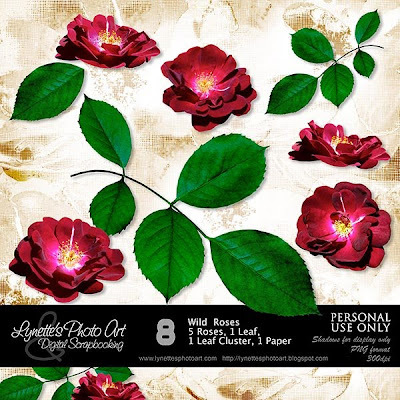 Wild Roses has five rich blossoms, a leaf, a leaf cluster and the cool paper you see. Click the image to enlarge. Click Buy It Now Button below the image to purchase for $1.99 at my PayPal Store. Today I'm giving you the blossom I made this paper from - enjoy! These are stunning, thank you! The wild rose is Alberta's provincial flower, but they're pale pink, not this beautiful deep colour. Love it! Thanks Lynette for all the great freebies! Love the password, too!